There are more than two million acres of rural and natural lands in Northeast Florida and determining which lands to preserve can be a challenging process. To facilitate this process, North Florida Land Trust has designed our own strategic conservation methodology to ensure we are preserving the highest quality natural areas. THE PROCESS: Strategic Conservation Planning is the process by which conservation agencies, community governments and non-profits can rank and prioritize natural resources and determine the significance of those resources toward their own goals. Once determined, maps of those resources are laid over each other with each resource having its own score according to its determined importance. Where resources exist in the same place, their scores are added together. Those added scores are represented as colors in a heat map of natural resources. Using this heat map, we can target the most resource rich lands. CONTACT US: North Florida Land Trust works with other nonprofits and community governments to provide strategic conservation planning services. If you are interested in working with NFLT on your own strategic conservation plan, please email us at info@northfloridalandtrust.org. Below are two examples of what we have done for other nonprofit organizations. Conservation Foundation for the Gulf Coast – North Florida Land Trust worked with Conservation Foundation for the Gulf Coast to identify land for conservation in Charlotte, Desoto, Hardee, Lee, Manatee, and Sarasota counties. 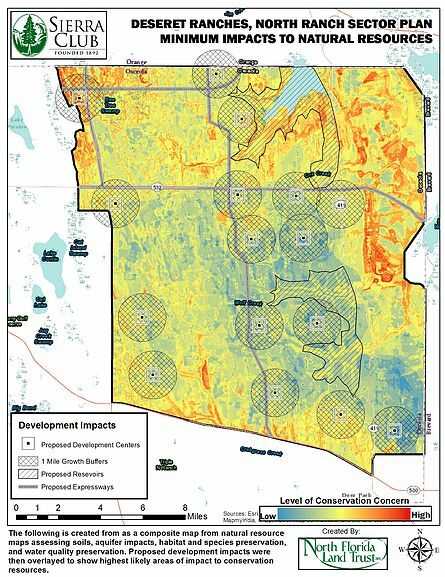 They utilized the strategic land conservation tool that NFLT developed to identify lands in North Florida and adapted it for use on the Gulf Coast. The tool created by NFLT is fully customizable to the priorities of any land trust or group interested in land acquisition, which allowed NFLT to partner with Conservation Foundation of the Gulf Coast to create conservation priority maps which reflect their priorities and core mission. 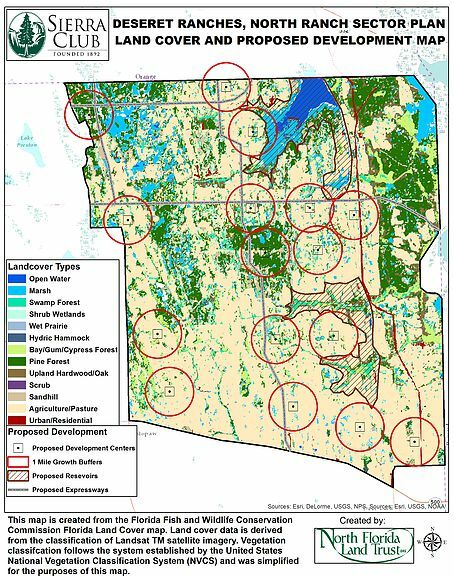 The conservation priorities map will help focus CFGC’s efforts, serving as a guide for targeted acquisition and future decision-making. Sierra Club Florida – After the announcement by Deseret Ranch of their intent to develop nearly 200,000 acres of their ranch holdings in Osceola County, North Florida Land Trust worked with the Florida Chapter of the Sierra Club and conservation activists to identify the resources that were at the greatest risk from development. The ranch holdings were nearly one-third of the entire county and resources that needed to be set aside for conversation had to be identified quickly. These maps show the areas that were at greatest risk for development.